A big thank you to all the wonderful and amazing champions who left reviews for Twelve Dancing Princesses! The short, Of Noble Heart, is now available! (Click here for the PDF File. I hope you like it!) I really hope you enjoy the short story. (But ohmygoodness I can’t wait for you to read the next one, it’s my favorite, favorite, FAVORITE!!) Now let’s jump in to today’s topic. Welcome back for the second round of the Twelve Dancing Princesses origins! It’s a bit unusual that I delve into two different versions of the story, but, as you will see by the end of the post, in my retelling I actually stitched these two versions together…and I’m too big of a geek to let that slide without pointing out how I did it. 😉 So here we go! One of our stuck-up gardener’s boy’s tasks is to give the princesses a bouquet every morning–which is how he falls in love with the youngest princess who is naturally also the prettiest. The enchantress returns to our dolt-of-a-hero in his dreams and gives him gardening advice on how to grow two laurels which will then bud flowers that will make him invisible. The gardener’s boy does this, and when his laurels are fully grown he sneaks into the princesses’ rooms while wearing the flower of invisibility and hides under their beds. The sisters search the rooms, but eventually get dressed in their prettiest gowns and go through a trap door. 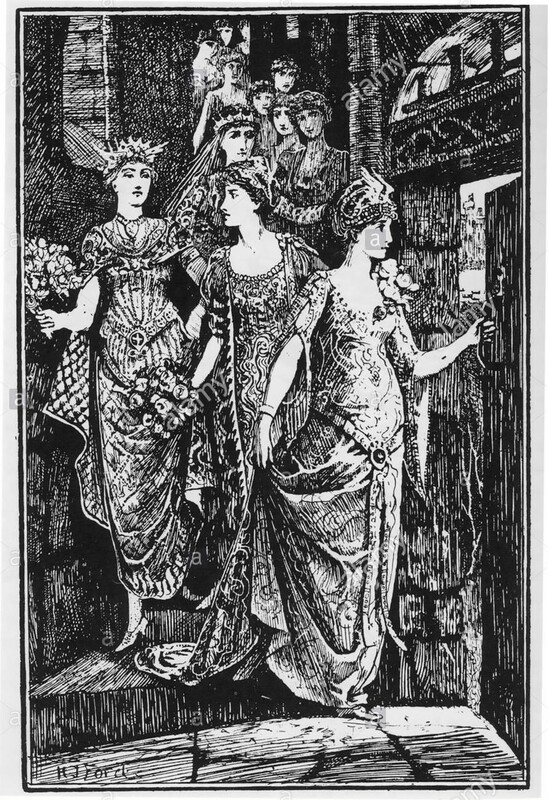 This gorgeous illustration of the princesses coming down their hidden staircase is the work of Henry J Ford, who lived from 1860-1941. As in the German version, our shallow hero is following so closely behind them he steps on the gown of the youngest princess. Similarly, they walk through the tree groves of the silver, gold, and diamond tress, and come to a lake where the twelve boats and princes are waiting for them. Just as the soldier did, the gardener’s boy hops on the boat of the youngest princess–who also lectures her prince for rowing so slowly. As a side note, I couldn’t make heads or tails of the castle. There are servants, and yes they have the princes, but no one explains who owns the castle or why it exists. A couple of variants credit the fairies, but that’s usually as far as it goes. Moving on! The princesses dance the night away and then hurry home shortly before dawn. On the way back the gardener’s boy snaps off a twig of the silver trees and then puts it in the bouquet meant for the youngest princess later that morning. The events repeat–though this time the shallow hero snags a gold twig and places it in the youngest princesses’ bouquet–and when he follows them a third time he snatches up a diamond twig. 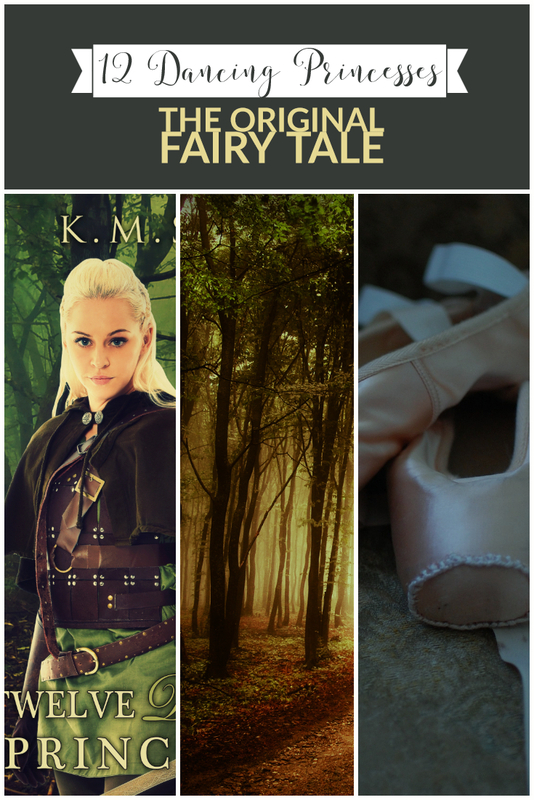 The youngest princess by now knows he has been following them, and even though the gardener’s boy promises not to tell anyone–including her father–she tattles to her older sisters who make fun of her for the gardener boy’s obvious infatuation with her. The eldest sister states they should throw him in prison and have him killed, which upsets the youngest. (I have no idea what she thought would happen, I mean really, they are already confirmed kidnappers!) Frightened, the youngest princess threatens to tell their father if they harm the gardener’s boy, so they decide to take him with them to the castle instead. Throughout the night the youngest princess insults the gardener’s boy, who responds calmly that she need not fear that she will become a gardener’s wife. After a night of dancing and food, the princesses try to feed him the philtre that will freeze his heart and force him to join the other princes they have captured/kidnapped. Oh, and Pookie made me think of the Pooka from MBRC. So, perhaps that should be the real comparison of characters. Morgan and Devin are so similar to Quinn and Emerys. So…. Hooded Evil Lady has to be someone we have seen before. I do want to guess. And part of me thinks it’s someone from this book. But I am probably was at off. So, a question… I have Kindle Unlimited and that’s how I stumbled upon your books. I just wondered how that works in terms of your profits? Do you get paid a certain amount when people check out your books with Kindle Unlimited? I’ve purchased a few of your books (the King Arthur series) to keep, but otherwise I tend to just check them out with Unlimited when I want to re-read. I just want to make sure I’m still supporting you and not taking money out of your pocket that way! Yes!!! Same question. And profits also when she’s giving out freebies. How does that work?!?! Thank you for the short story, and the summary of the French version of the story. I think my favorite picture book is a variation on that, in which the gardener and the youngest princess are kind and sweet. *cough* BTW, you have 117 reviews…. Read the book Friday, it was so sweet! I loved Quinn and Emrys, they reminded me of Britt and Merlin (Make no mistake that is a positive, I miss those two so much!) But still had there own character traits. I’m also so thrilled to see the story coming together. I find it so hard to imagine Evariste as young, up until Sleeping Beauty I had him pegged as a Gandalf type and I still haven’t really shook that. I’m so curious to learn more about the chosen, this series is really genius. Haha, you know what’s ironic? Another name for Merlin was Emrys! That aside, I loved how you combined the two versions of the story together! It’s already my new favourite, and I can’t wait to see more of Angelique, Quinn and Evariste! I hope she finds him soon. They really deserve a happily ever after. Quinn is also one of my favourite heroines in this series, since she’s the one who actually offered to help Angelique instead of the other way round. It was really nice to get a glimpse of how much stress Angelique has been under for the past /5 years/! I do have a question about her magic though (which was totally awesome, by the way). When her appearance changed, was that a result of a block she might have placed over her magic or was is a result of her wanting to seem less frightening or something? Also, is the Chosen actually part of the Veneno Conclave. Thanks for yet another wonderful book! I /knew/ Emerys sounded familiar!!! And yes, he reminded me of Merlin too – in the best way possible! So sassy and vulnerable at the same time! And Pookie kept making me think of Devin- I think this is one of my favorite Timeless Fairytales so far! *mild spoilers* Hi! I started reading your books a few months ago (have read most them twice by now), and eventually found my way here. I just finished reading Twelve Dancing Princesses today. I wanted to say that I enjoy your analyses of original fairytales because I usually agree with them! I have spent some time thinking about the problems in this one too. Those old fairytales were full of psychopaths, and in this case, the princesses were the psychopaths. I can’t help being a little disappointed that you didn’t make them all evil (since I would enjoyed reading that), but for the story’s sake, I think you definitely made the right decision in making two or three of them be really selfish and shallow, and letting the others be caught up against their will. I also laughed at your four sets of twins, since the age problem had occurred to me. How do you get 12 sisters who are young enough to be unmarried, and yet old enough to participate? And thank you for not making Roy into a bad guy. I really hate it when stories do that–taking someone the protagonist has loved and trusted and known really well for a long time, and making him or her turn out to be a really terrible person. Not only is it unpleasant, but it’s just not really realistic to think that she could have fought and worked and spent so much time with him, under so many pressured situations, for so many years, and not really known what his true character was. So I was glad to know that he was, if a bit foolish at times, a good guy, and she wasn’t a complete idiot for having loved him. It makes the happy ending all the happier. So to the comment you made about not knowing why the father of the princesses is a duke here is what I think. I think the father could be called a duke and the daughters’ princesses, because people can have more than one royal title; a prince can be a duke and have daughters that would be princesses; for instance Prince William is also the Duke of Cambridge and his daughter is princess Charlotte. So huge problem: I havn’t been able to read the book yet. And I know I shouldn’t have read this post, but now I need to read it EVEN more!